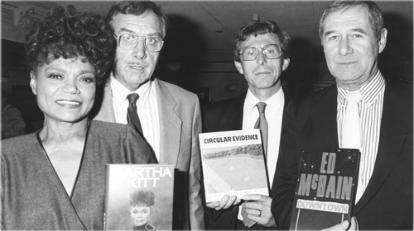 McBain with their best selling books, London 1989. Kitt died on Thursday of colon cancer, according to family spokesman Andrew Freedman. of America's most versatile performers, winning two Emmys and nabbing a third nomination. She also was nominated for several Tonys and two Grammys. the 1960s for denouncing the Vietnam War during a visit to the White House. even as she neared 80.
women would envy. Kitt also wrote three autobiographies. life single, though brief romances with the rich and famous peppered her younger years. appearances in "Shinbone Alley" and "The Owl and the Pussycat." "I Want to Be Evil," "C'est Si Bon" and the saucy gold digger's theme song "Santa Baby,"
which is revived on radio each Christmas. featured "Let's Do It," "Smoke Gets in Your Eyes" and "My Heart Belongs to Daddy." recording category for the 1969 record "Folk Tales of the Tribes of Africa." Blues" in 1958 and more recently appearing in "Boomerang" and "Harriet the Spy" in the 1990s. replacing Julie Newmar who originated the role. A guest appearance on an episode of "I Spy"
brought Kitt an Emmy nomination in 1966.
came as she attended a White House luncheon hosted by Lady Bird Johnson. snatched off from their mothers to be shot in Vietnam." the FBI and CIA, which allegedly found her to be foul-mouthed and promiscuous. out of work," Kitt told Essence magazine two decades later. nomination - and was invited back to the White House by President Jimmy Carter. Rodgers and Hammerstein's "Cinderella" in 2002.
a chance now than we did then to play larger parts." don't think of myself as belonging to any particular group and never have." Performing Arts, later dropping out to take various odd jobs. Kitt's travels with the Dunham troupe landed her a gig in a Paris nightclub in the early 1950s. Kitt was spotted by Welles, who cast her in his Paris stage production of "Faust." Lawrence, Paul Lynde and, as a writer, Mel Brooks. paradoxes in Kitt's private life. who showered her with lavish gifts. In 1960, she married Bill McDonald but divorced him after the birth of their daughter, Kitt. child. She referred to herself as "that little urchin cotton-picker from the South, Eartha Mae." verified her birth date as Jan. 17, 1927. Kitt had previously celebrated on Jan. 26. Post online. "The biggest family in the world is my fans."